Achieve The English Fluency That You Have Always Dreamed Of! English fluency is something that all English students dream of. How do you define fluency? Does it mean speaking without making any mistakes? Does it mean speaking without fear (even if you do make a couple of mistakes)? Does it mean something else for you? That is why I'd like to introduce you to "English Harmony". Bettina, a star member of the "Learn English Corner" (social network) recently asked me what I thought about the program. She wasn't sure if she wanted to buy the course, so she asked me to give her my honest opinion. You can read my responses here. 1) You don't waste your time. It teaches you useful expressions and word chunks (groups of words) and it does it all through listening and speaking. 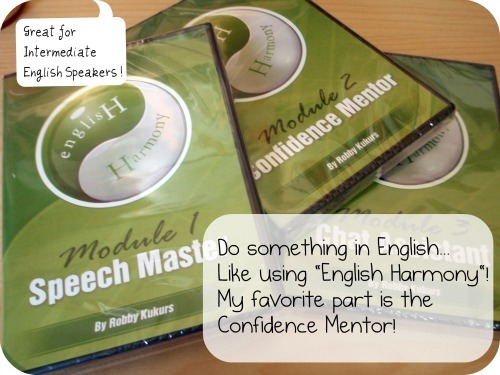 2) The confidence mentor DVD helps you believe in yourself and think positively. It allows you to ignore the negative beliefs that you may be holding about your English. "My English isn't good enough, mistakes are bad etc". It is such a great book that I recorded it so you can listen at the same time as you read it. Also, just in case you wanted to watch them again (and larger) here are my review videos of the program. If you'd like more information about the course or would like to ask Robby an English fluency question just visit the oral fluency forum here.